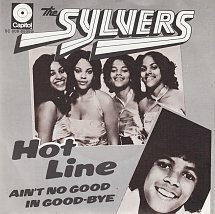 Hans Worst Hits of the 70’s- “Hot Line”- The Sylvers. The Sylvers had three hits during their career- Boogie Fever went to #1 and Hot Line #5 in 1976 and then High School Dance #17 in 1977- I don’t think I ever heard that one. I could have picked either Boogie Fever or Hot Line as a Worst Hit- both are dreadful but I have to go with Hot Line because after just playing it I know ‘ hot line, hot line, calling on the hot line, for your love, for your love” is going to be stuck in my head all day now. There were ten Sylvers- and nine of the ten at one time or another were in the band- only the youngest Christopher wasn’t in the band- he died at age 18 of hepatitis. They beat The Jackson’s and The Osmonds 10 to 9 as far as children go. Hot Line was written by Freddy Perren and Kenneth St. Lewis. Perren a songwriter-producer, arranger, orchestra leader- chief bottle washer- also produced and wrote Boogie Fever- he is also responsible for writing I Will Survive-by Gloria Gaynor and Shake Your Groove Thing by Peaches and Herb. It’s still in my head hours later..
hmmm. I don’t know why it does that. lol maybe they ban bad music!